As I (sadly?) pace back and forth down the freezer aisle trying to discover something that catches my interest, I realize that I have been playing it safe recently. 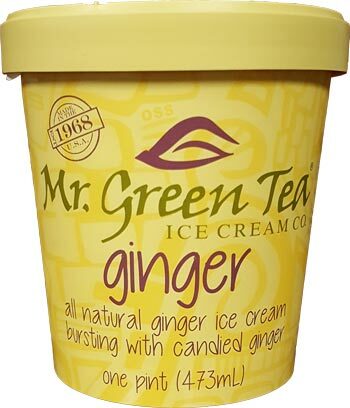 While this blog has always been about encouraging you to try new things, I couldn't help but find myself reaching for the safest of the Mr. Green Tea flavors... Madagascar bourbon vanilla ice cream which apparently isn't even on their website. The MGT site does list chai latte, ginger, black sesame, green tea, red bean and fortune cookie. I really wanted fortune cookie but it was the only flavor Stop & Shop (Giant) didn't have. Ok, I'm skipping "The Profit" backstory and jumping right in to this pint. Wow, that's a kick in the tastebuds. I didn't even notice it as first, but then WHOOOOO my sinuses are open. Is my tongue tingling a little too? If you love ginger, I can't imagine you wouldn't like this. 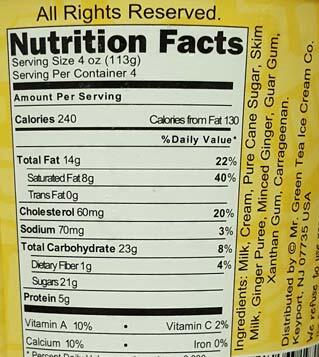 If you've never had ginger by itself, you may want to avoid this particular flavor as your starting point. It's just way too bold to win over us skittish people. I can see somebody taking a bite and going "thanks, I'm good". 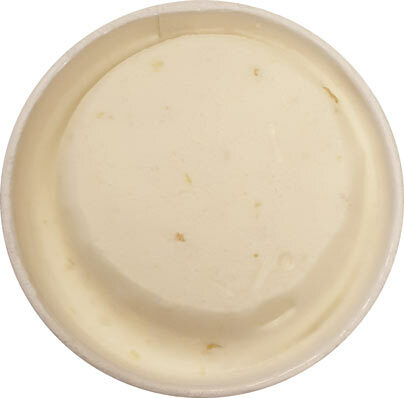 (try something like the mild Sweet Scoops froyo version first if want). That all said, I'm going to proceed. I did envision ginger flavored hard candies, but it's really just tiny bits of actual ginger everywhere. Ha, I can see tiny ginger fibers on the piece I just pulled out. 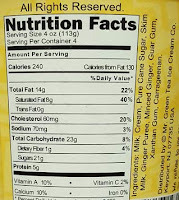 It does say "minced ginger" in the ingredient list! To recap, not crunchy bits! Despite clocking in at 113g per serving, it's not a superdense ice cream. It's actually fairly soft which I assume is partially aided by a few gums in the mix. It's pleasant enough but you'll definitely notice a difference from say B&J or H-D. I don't know if this is a thing, but I feel like my heartburn is acting up, though keep in mind I usually get heartburn from gingerbread cookies (aka this is my fault, not theirs). I've been using the sweetness of this to keep me going, but I think I will stop now that I'm about an inch in to the pint. So this pint was on sale for $3.49 and I'd say that's a fair price to try something out of my comfort zone. It was also good enough to make me consider trying one of their other flavors though I really don't know which one that would be. 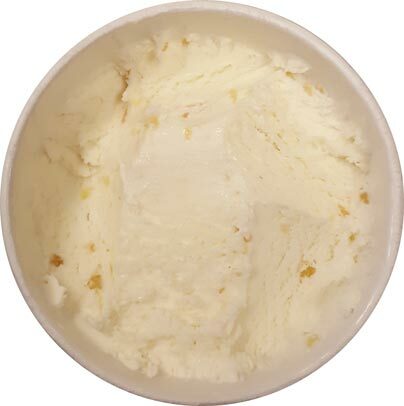 On Second Scoop: I was trying to quantify this yesterday, but there is almost a bright citrus burst to this flavor when it first hits your taste buds, something akin to biting in to a mandarin orange. There's that effervescence that washes over you as you dig in. I also want to say that there is almost a buttery or maybe even a tea note to this, whether it's the base or the flavor I don't know, but it's there. I think this is definitely off the beaten path for a lot of us (though please correct me if I am wrong). The funny thing is that despite that bit of burning ginger kick, I still find myself going for another scoop. I think that's an endorsement right? I've purchased numerous flavors from this brand, although never this specific one. I'm very glad you reviewed it and saved me the disappointment as I HATE ginger!!! I was wondering if it would be subtle, but I'm glad I didn't take that leap of faith. The fortune cookie was good, but the cookie pieces were weird and soggy, so it wasn't too impressive other than the really satisfying, premium vanilla ice cream base. My favorite is their black sesame pint, I always pick it up when it's on sale! I've written to the company twice asking them to release a taro flavor, so my fingers are crossed that's one of the new flavors! It would be perfect in their lineup and I LOVE taro flavored ice cream (Sweet Frog had a taro yogurt which originally started the obsession with ethnic flavored ice creams for me). Ha, glad to help. I enjoyed the H-D toasted sesame so maybe I should try the black sesame next. I just tried this flavor and love it. But then I love ginger. Very satisfying in that I didn't feel I needed to eat the whole pint in one sitting! I think it is because there is a great mouth feel, and really good flavor. For those who do not like ginger, I recall the first time I tried candied ginger. I didn't like it. But now I love it. Always have some in the house. And I discovered how much I like ginger in other ways, by tasting foods and wondering what that lovely flavor was. Often it was ginger. Love this ice cream. Going to try and make my own at home.